2018 once again begins with two significant awards for the Irizar Group. The Irizar ie tram, Irizar’s recently launched electric, zero emissions articulated bus, has been named 2018 Spanish Bus of the Year and Environmentally Friendly Industrial Vehicle of the Year. 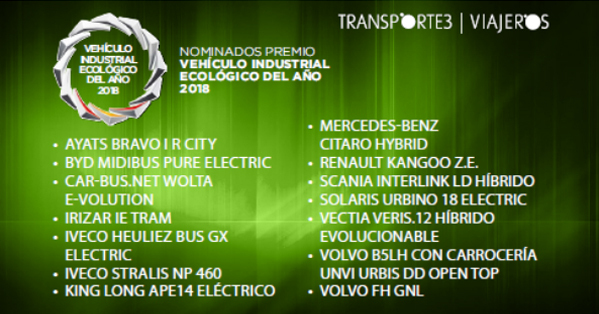 These awards, established by the road transport sector magazines, Transporte 3 and Viajeros, reward the excellence of new bus and coach models and are recognised as the nation’s most important awards in the bus and coach category. The jury, made up of entrepreneurs from the passenger transport sector, associations, technical specialists and experts in the automotive sector and the fields of electromobility and the environment, decided to name the Irizar electric tram (ie tram) the Bus of the Year and Environmentally Friendly Industrial Vehicle of the Year. The awards ceremony, which took place on the 17th of January at the Novotel Madrid Center, was attended by José Manuel Orcasitas, Irizar Group CEO, and Hector Olabe, Director of the group’s new company, Irizar e-mobility. The event brought together about 500 people, entrepreneurs from the sector, members of the main industry associations and institutional representatives. In the words of José Manuel Orcasitas, “These two awards recognise the great strategic leap taken by the Irizar Group in recent years to position ourselves among the leaders in offering integral, pioneering, cutting-edge and totally sustainable technological solutions”. 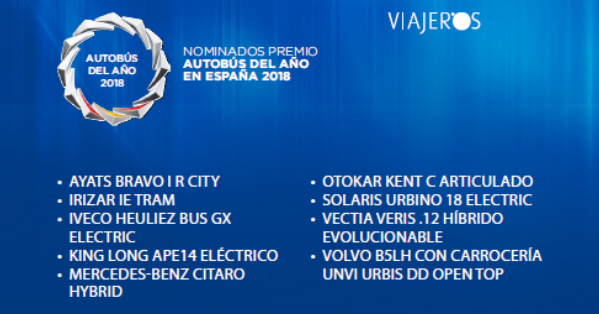 This is the first time that a single Irizar vehicle has received two awards during the same year and the second time that an Irizar electric bus has received both awards. The Irizar ie tram is an articulated 18-metre bus. This bus, with the appearance of a tram, has been developed on the basis that its design helps to make the service and the city more attractive and ensures the comfort of passengers. The combination of the large capacity, ease of access and internal configuration of a tram and the flexibility of a city bus, together with the fact that the bus creates zero emissions, define the DNA of this new vehicle. The Irizar ie tram offers a clean, minimalist design and all its features correspond to specific functional aspects allowing it to create an identity and an image that are easily recognisable to its users. Every last detail has been considered in order to achieve the appearance of a tram, including the hubcaps and the rear-view mirrors, which have been replaced by cameras that display their images on two screens inside the vehicle on each side of the driver. Accessibility, safety, passenger flow and passenger comfort are the inspiration behind the interior design architecture. The new Irizar ie tram is fully equipped with Irizar Group technology both in terms of electronics and communications and in its main systems: power train, batteries and charging systems. This technology has been tested in Irizar’s laboratories and test benches, and in the vehicle itself, and optimises the flow of energy between the different systems involved in electrification, such as the propulsion system, battery storage, EBS and auxiliary equipment. The high power density and long life batteries are Lithium-ion batteries from the LTO (Lithium Titanate) family. The 230 kW permanent magnet synchronous motor is sufficient to meet operational requirements. The Hispacold climate control system, designed specifically for zero emissions electric vehicles, offers a perfect balance between the thermal comfort of passengers and the energy optimisation obtained by Irizar for its electric vehicle. The 18-metre vehicles have been equipped with electric doors developed by Masats; the front swing door has a safety sensor and the other sliding, metro-style doors also have sensors. This bus is undoubtedly designed to offer maximum reliability and efficiency. The new Irizar pantograph allows the vehicle to be charged in just a few minutes during its journey. Its modern and minimalist design offers easy integration into the urban landscape. The charging stations are installed at strategic locations in the city, at the beginning or end of each line. The system is equipped with an articulated arm that enables the charger to be automatically or manually connected to the bus batteries, and charging only takes around 5 minutes.